Pictured above is the Lotus Exige 265E. 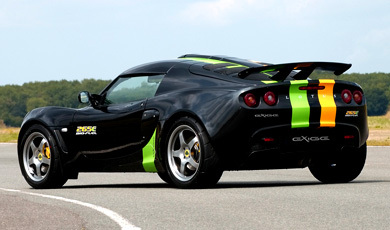 Not only is it the most powerful road version of the Exige – it runs on Bio Ethanol! This biofuel powered speedster accelerates from 0-60mph in just 3.9 seconds, and generates over 260 brake horse power from its supercharged 1.8 litre engine which tops out at 158mph! The Lotus Exige 265E (‘E’ signifying the engine can be powered with ethanol fuel), was developed in just 5 weeks during which Lotus engineers re-engineered the Toyota engine in a standard Exige to run on bio-ethanol. Using bio-ethanol results in as much as 70% less net emissions on carbon dioxide since the wheat (or other crop) absorbs carbon dioxide while it is growing. The changes required were relatively easy to achieve – for example, ethanol fuel burns more efficiently (octane rating of 106-110) than petrol so the engine management software of the car needed to be reprogrammed, as did the supercharger to deal with the extra power generated. Of paricular note is that without making major mechanical changes to the car, it generated extra power simply because the biofuel (85% ethanol 15% ordinary petrol) used is more efficient. The 265E is quicker in all departments than the original Exige. The only real problems with the ethanol powered version of the Exige are that it is very difficult to find a petrol station that sells bio-ethanol fuel (Morrisons supermarkets around Norfolk sometimes have it), and that each gallon of biofuel contains less energy than a gallon of petrol giving worse fuel economy and so less miles per gallon and more stops. One final problem could be emissions. Although net emissions of an ethanol powered car are much lower than with a standard petrol powered vehicle, the amount of carbon dioxide actually emitted from the exhaust pipe is higher and could lead to failure of the MOT!